While many companies have been laid low by the consumption slowdown, investors in Titan Co. Ltd don’t have that worry. After all, the jewellery retailer’s March quarter pre-result update last week said it was aiming for a 20% revenue growth in fiscal year 2020 (FY20). That is an encouraging goal when the broader Indian consumption theme isn’t very inspiring. Analysts from Motilal Oswal Securities Ltd say Titan’s 20% revenue growth aspiration indicates that not only are all divisions firing well but also that jewellery sales will grow even faster than the company’s overall sales growth. “If achieved, it will be the third year of better-than-expected jewellery sales,” the brokerage said in a 4 April report. Titan would be one of the key beneficiaries of the shift to the formal market. Investors, of course, have taken cognizance and that is reflected in the gains the stock has made. Year to date, it has risen almost 18%. The Titan stock currently trades at an enormous 52.5 times estimated earnings for FY20, based on Bloomberg data. No doubt, valuations are expensive, suggesting investors are folding into the price a good share of the optimism. Nevertheless, given that the company is set to capitalize on the anticipated shift to the regulated market, high valuations could be well-supported. For FY19, Titan said total sales have grown about 21%. Boosted by store additions, jewellery sales increased 22%. It added 35 Tanishq stores (net) during FY19. For the March quarter, jewellery revenue can be expected to have grown about 16%. Titan derives over 80% of its revenue from jewellery sales and the division has consistently been its key growth driver. The remainder comes primarily from watches and eyewear. The watches business is Titan’s second-largest revenue grosser. 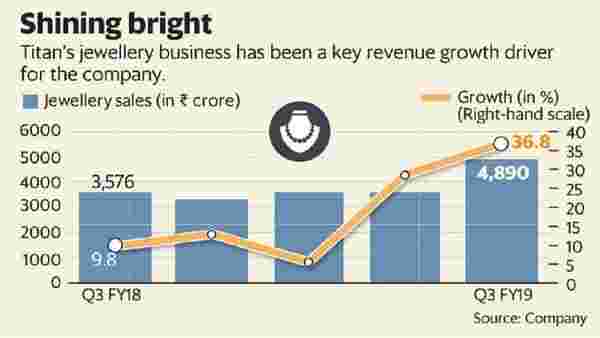 The segment has seen about 16% growth for FY19 aided by product launches, according to the company. Eyewear revenue grew 23% in FY19. Even as the revenue growth performance and outlook has brought cheer, investors would do well to focus on Ebitda (earnings before interest, tax, depreciation and amortization) margins when the March quarter and year-ended results are declared. Management commentary during the earnings conference call could offer notable insights regarding the demand outlook and business environment.